With our famous 100% satisfaction. If damaged in shipping, or even if you change your mind - simply let us know and we will either replace it or refund your money, your choice! 2 year warranty only charge postage $5.75-15 Vary by customer. 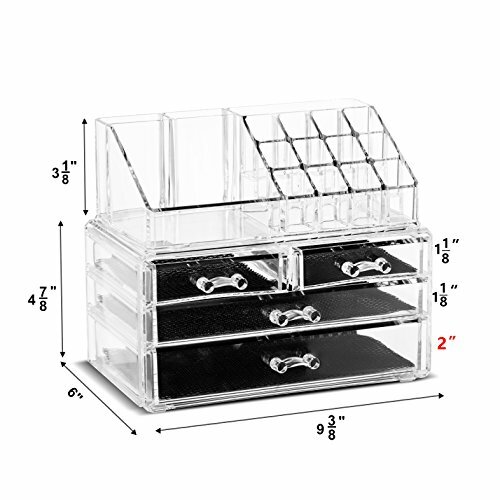 Clear acrylic makeup organizer matches any decor. A perfect small size makeup organizer for girl teenagers and youngster to store their jewelry and private make up belongings. Create your own beauty counter in bed room,bath room or shower room. Removable black mesh padding keeps jewelry protected. Approximate Bottom Part Dimension: 9 1/2" x 5 1/2" x 4 3/8"H, Approximate top part brush holder Dimension: 8 3/4" x 3 1/8" x 5" , Approximate Set Dimension: 9 1/2"W x 5 1/2"D x 7 1/4"H.
100% satisfaction guarantee,If for any reason you're not completely happy with your purchase, or even if you change your mind - simply let us know and we will either replace it or refund your money, your best choice!